WASHINGTON, D.C. -- Public college or university graduates are more likely than those who graduated from a private university to strongly agree that they were exposed to people of different backgrounds during their collegiate experience. If U.S. college graduates strongly agree that they interacted with people from different backgrounds on a regular basis in college, the odds that they believe their college degree was worth the cost are 2.2 times higher than other graduates who do not strongly agree that they interacted with people from different backgrounds. 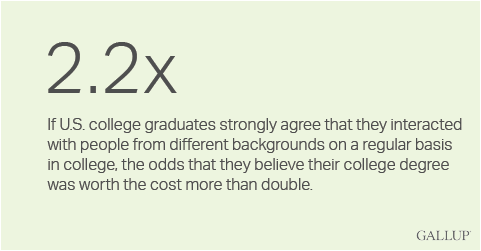 The Gallup-Purdue Index explores the perceived value of a college degree by asking respondents the extent to which they believe their degree was worth the cost. The relationship between being exposed to people from different backgrounds and believing their college degree was worth the cost exists even after controlling for personality type, student loan amounts and other collegiate experiences that Gallup has previously demonstrated correlate with the perceived value of a college degree. Gallup evaluated data from this study as the U.S. Supreme Court prepared to review a potentially landmark case on affirmative action brought against the University of Texas at Austin by applicant Abigail Fisher. Fisher, who first took her case to the U.S. Supreme Court in 2008, contends that the university's affirmative action policy resulted in her rejection by the university. While the Supreme Court sent the case back to a lower court, it has returned to the Supreme Court for another review. The Supreme Court's decision will set a legal precedent that could affect students' exposure to diversity throughout their higher education experience. Researchers have consistently demonstrated a relationship between exposure to people from different backgrounds in educational settings and positive long-term outcomes, including increases in cultural awareness and a commitment to racial understanding. The Gallup-Purdue Index explores this phenomenon by asking college graduates the extent to which they agree or disagree that they were exposed to people from different backgrounds on a regular basis during their undergraduate experience. Gallup asked this question of recent college graduates who obtained their degree between 2010 and 2015 because these graduates should be most likely to accurately recall their experiences with diversity. Slightly less than half (46%) of all recent college graduates strongly agree they were exposed to people from different backgrounds on a regular basis during their undergraduate experience. Public college graduates (49%) are most likely to strongly agree they interacted with people of different backgrounds while in college, followed closely by private for-profit graduates (46%) and private not-for-profit graduates (41%). These results are based on the 2015 Gallup-Purdue Index survey of college graduates. The Gallup-Purdue Index survey is a comprehensive, nationally representative study of U.S. college graduates, aged 18 and older, with Internet access, conducted Dec. 16, 2014-June 29, 2015, with a random sample of 30,151 respondents with a bachelor's degree or higher. If recent college graduates strongly agree that they interacted with people from different backgrounds in college, the odds that they are engaged in their current job are 1.4 times higher than other graduates who do not strongly agree with this statement, suggesting a link between exposure to diversity and future work fulfillment for college graduates. 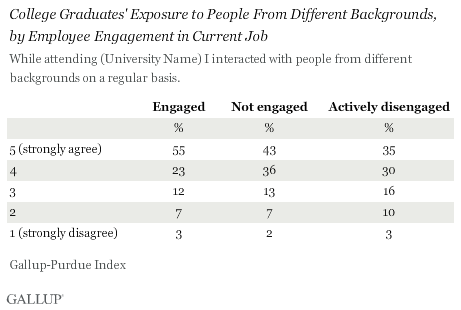 More than half (55%) of recent college graduates who are currently engaged in their job strongly agree that they were exposed to people from different backgrounds during their collegiate experience. In contrast, 35% of recent college graduates who are actively disengaged in their job strongly agree with this statement. Even after controlling for other factors that Gallup has identified, including personality type, student loan amounts and other collegiate experiences, this relationship is linked to employee engagement. Results from this study indicate that exposure to people of different backgrounds provides graduates with a greater sense of value of the cost of their college degree. While colleges and universities often strive for diversity among their student population, Gallup's research indicates that graduates also view these practices as beneficial in contributing to the overall value of their degree. For some students, college represents the first opportunity to engage with others from different backgrounds. The Gallup data suggest such students could benefit from more deliberate efforts among colleges and universities to encourage interactions between students from different backgrounds. The upcoming Supreme Court review of the University of Texas' affirmative action policy will have a tremendous bearing on the extent to which colleges and universities can encourage diversity within their student population. Results for the Gallup-Purdue Index are based on Web surveys conducted Dec. 16, 2014-June 29, 2015, with a random sample of 30,151 respondents with a bachelor's degree or higher and 4,753 respondents who obtained their degree between 2010 and 2015, aged 18 and older, with Internet access, living in all 50 U.S. states and the District of Columbia. For results based on recent college graduates with a bachelor's degree or higher, the margin of sampling error is ±2.2 percentage points at the 95% confidence level.